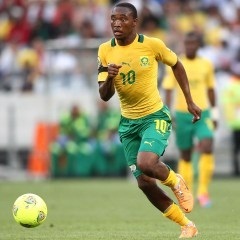 Cape Town - Sibusiso Vilakazi's second half goal earned Bafana Bafana a 1-1 draw with Cameroon in an international friendly at the Stade de l'Amitié. According to the soccerladuma website, Cameroon opened the scoring as early as the sixth minute, as Vincent Aboubacar curled home a sublime free-kick from the edge of the area. Shakes Mashaba had a early scare midway through the first half, after Andile Jali had been stretchered off, although the former Orlando Pirates midfielder did return to the field. Bafana were on the back foot from the start but got stronger in the closing stages of the first half, with Bernard Parker firing just wide from 12-yards out in the 37th minute. Meanwhile, captain Dean Furman and Rivaldo Coetzee, picked up yellow cards in the first half. Bafana registered their first effort on target in the 56th, as Thabo Matlaba's effort from the edge of area was palmed away by Fabrice Ondoua. Bafana improved in the second half and were rewarded in the 77th minute courtesy of a fine finish from Sibusiso Vilakazi. Mashaba's men finished the half the stronger of the two but failed to get the winner in the closing stages.